While experimenting with various linux distros and dual booting, we often delete or alter linux partitions mistakenly. That's when GRUB rescue is necessary. At this point, GRUB fails to load a proper configuration file or related modules to boot. And basically there could be four different types of GRUB rescue mode. If the configuration file grub.cfg is missing or corrupted, then it should show the grub> prompt to perform further steps. The entire /boot/grub/ directory is corrupted or missing and showing the grub rescue> prompt, and possibly with unknown filesystem error. Then you've to perform some different rescue steps to boot. The GRUB 2 bootloader is replaced by another bootloader like of Windows bootmgr or syslinux, then it's another story. You don't want to dual boot windows and Linux any more, so formatted the entire Linux partitions. But GRUB is still present, and it's not booting to Windows. The third situation happens when you install Windows over an existing Linux installation. As the Windows bootloader can't detect the Linux partitions by default. The fourth point is an entirely different situation, and we're not going to fix that in this tutorial. Note: It's always good to have a bootable USB ready with at least one linux live distro for a easier rescue, repair or reinstall process. So, here we'll deal with 3 different situations of broken GRUB bootloader on older BIOS systems, or the operating systems were installed with BIOS compatibility mode. First run the ls -l command to list all available disk partitions and filesystem type. 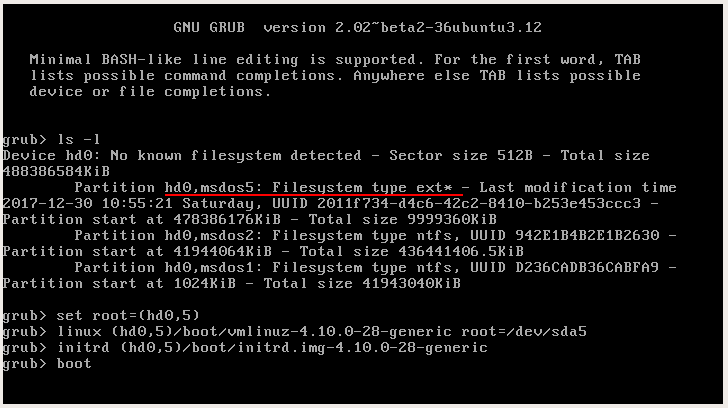 Now identify your Linux system's root filesystem, in my case it was (hd0,msdos5) , highlighted with the red underline. Why msdos? As I was using the older MBR partition table. To check if everything is all right under the linux partition you can use the ls command again. ls (hd0,5)/ and ls (hd0,5)/boot/ . If you can see the vmlinuz-xxxx and initrd.img-xxxx files under the /boot directory then start loading the kernel and initrd as instructed below. Type the command below one by one, but not the exactly same commands. Your system will be different from mine most probably. Tip: Use the Tab key while typing. After typing the last command and hitting the Enter key, Linux should start booting. When the boot process is completed, login as usual and open up the the terminal application to update the GRUB configuration. Just run the sudo update-grub command and it should do all the hard work for you. Basically you need to set the proper path for the kernel and the initrd image file. The good news is the Tab autocomplete works just fine withing the grub rescue shell. So you can hit the Tab key to get visual feedback and avoid typing long lines. Note: If you have a backup copy of the grub.cfg file, then you can use the loadconfig command to easily boot to the Linux distro. The above command is an example, assuming the system have a backup grub configuration file under the /root/backup directory. If the contents of /boot/grub/ directory is accidentally deleted or corrupted somehow, the rescue process is little different. And there's two possibility in this case, first try to load few modules with the insmod command, like insmod normal. If it can load the modules, then it's possible to rescue without a Live CD. But if it can't, the you'll definitely need a live CD or USB, and follow the next step below. So, if the grub rescue prompt can load the modules, then you can recover it. You've to type the commands listed below one by one, but don't forget to modify them according to your system. If there is any grub.cfg file under the prefix directory, /boot/grub in this case, then it will be used. The GRUB selection menu will pop out just after typing the normal command. If there's no GRUB selection menu, then you've to specify the kernel and initrd files and manually start the boot process. Then the commands should look like below. In Ubuntu or Debian, the linux kernel and initrd files are symlinked to the / directory, so using the symlinked files here. Again after booting to the linux system, run the sudo update-grub command to regenerate the grub configuration file. If Windows is installed after installing Linux, most probably Linux won't boot at all. The windows bootloader can create Linux entries, but that's another long way. This step is also for you if the GRUB installation directory is deleted or corrupted. So, here we will use a linux live USB to fix this issue. If the installed linux is 64 bit, then any 64 bit live CD should work well. First get a Live CD or USB and boot your PC/Laptop from the USB or the CD drive. That's should be pretty easy for you, I guess. After booting to the live session, recognize the linux root partition with fdisk -l command. In my case, it was /dev/sda5, but your's could be different. Now mount the Linux root partition, as we're going to to setup a chroot environment. I'm making a new directory,/mnt/chroot for easier understanding. Again, don't just type the commands above, modify them according to your system. Now check if the the linux root partition is mounted properly or not with the command below. If everything is mounted properly, then start the chroot process, commands listed below. At this point you should be inside the chroot shell. Additionally you can run the source /etc/bash_completion command to enable Tab auto completion. Finally install GRUB, make sure you know the correct device you want to install. In my case, the targeted device for grub installation was /dev/sda . Now exit the chroot by running the exit command, and reboot the Laptop/PC. Though it's better to unmount the linux partitions before reboot, but jsut leave it this time. In case the operating systems or GRUB is loaded in UEFI mode, few different steps needs to be performed. So, here's the guide to rescue broken GRUB on UEFI based systems, more precisely if you prefer to boot the operating system in UEFI mode. If you laptop/desktop supports UEFI, it doesn't mean that you're using UEFI to load the operating systems. If the hard drive/SSD has a GPT partition table, then there's a higher chance that you're using UEFI. There must be a FAT32 partition of around 100MB or more if the system is using UEFI. This FAT32 partition is called EFI System Partition, or ESP. In case Windows 10 was pre-installed on your laptop, then most probably it's using UEFI by default. Here you can check if you're using UEFI at all or not, both on Windows and Linux. However it's not possible to check the same if you're on GRUB rescue mode. At this point, you could have five possibilities. GRUB and it's all related files are present, jut the configuration is corrupted or missing. Hard drive's partition UUID is changed, rescue prompt is showing no such device or no such partition error. All the GRUB related file under the /boot/grub directory are missing or corrupted. The GRUB UEFI executable file is missing or corrupted. Entire Linux partition is deleted. In that case it's impossible recover, full re-installation is required. Note: Please don't be confused here, I'm just telling you the possibilities. If the third and fourth point happened, it's not possible to recover without a Live CD or USB. The fifth point is out of discussion in this tutorial. Instead you could follow the dual boot tutorial to re-install Ubuntu. Undoubtedly this is the first thing you should check. Why I'm stressing this point? May be your motherboard supports UEFI, but you're not using it. And I've seen it a lot. So one way to be sure about that to check if the ESP partition is present or not. First use the ls command on the rescue prompt to list all the disk partitions. Then again use the ls (hd0,X) command to check the filesystem type. Replace the X with actual partition number, like 1, 2, 3. The above screenshot shows that the 2nd partition is the ESP. It's a real 500 GB hard drive connected to Virtualbox to take better screenshots. However there's no Linux installed, just to show you the ESP. Note: If there's more than one hard drive installed on your system, then it will also show the other drive as (hd1). If you don't know what is the Linux root partition yet, then you've to find it out. Again we'll be using the ls command to check the contents of each partition. Replace the X with actual partition number. The linux root (/) partition should contain bin , boot , etc and other similar directories. After being sure about the linux root partition, run these commands one by one on the rescue prompt. Also don't forget to replace the x with the actual hard drive partition number. If there's a proper grub configuration file under the /boot/grub directory, it will be loaded. This should take you to the GRUB menu, select the Linux operating system and boot to it. After successfully booting and logging in, you've to install GRUB and generate new configuration file. Open up the terminal application, any of them should be fine. Then mount the ESP partition and install GRUB with UEFI support, example below. Here assuming the /dev/sda is the main boot drive. There should be no error while installing the GRUB bootloader. Finally update the GRUB configuration with sudo update-grub , and you should be able to boot normally after next reboot. As I've said before, if the GRUB modules under /boot/grub directory or the GRUB UEFI executable files, namely BOOTx64.efi and grubx64.efi are corrupted or missing, it's not possible to repair from the rescue mode. So, here we've to use a linux live CD or live USB, any 64 bit live linux distro should work. Assuming you know how to create a live USB and you already have one ready. So, power off the laptop/PC, plug in the USB drive containing your favorite live distro and boot to it. After successfully booting into the live session, you've to identify the linux root partition and the EFI system partition. Use the fdisk command, example below. 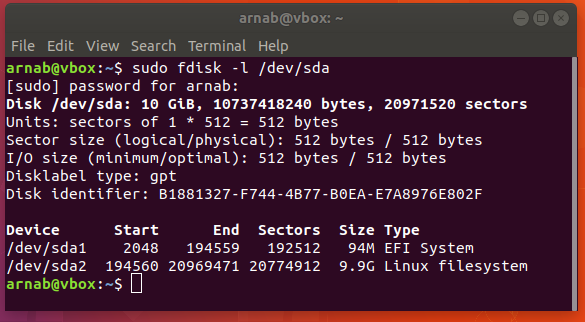 So, here you can see that the /dev/sda1 is the EFI system partition and the /dev/sda2 is the linux root filesystem. Now we've to mount those partitions accordingly and create a chroot environment. We'll be using a folder, /mnt/chroot to mount the partitions. Let's mount other necessary directories to the chroot environment. After chrooting inside the /mnt/chroot directory, it's time to reinstall the GRUB in UEFI mode and update the configuration. Both of these should run without any error. Finally restart the system to check if the GRUB reinstall is successful or not. If everything was done correctly you should be able to see the GRUB's OS selection menu, along with other OS entries, if there is any. I hope this tutorial will help you to deal with varuious grub rescue related situations, and it's simple enough to understand. But here the real point, did it worked on your system to rescue or repair grub? If not please let me know through the comments, and also don't forget to share your opinions. how do i boot a usb drive from grub rescue?? If the prompt is grub rescue>, then it's possible. Set the root device is (hd1,1), or something like that. depending on how many bootable device are connected. Also you've to load proper modules, kernel and initrd. You may also need partition UUID. Arnab a very BIG THANK YOU, for the painstaking effort but an effective and impeccable document/guide you've presented for us. But unfortunately brother I am facing some problems. PLEASE HELP. My Desktop-PC runs on UEFI BIOS with Dual mode boot. I had to re-install Windows again, due to some problems and issues, as a result, the "grub" got overwritten by Windows boot manager. I followed your steps in the guide exactly step-by-step with proper and successful "chroorting" of the environment under live USB(Fedora distro). My Desktop system's "efi" resides on "/dev/sda1" and root of Fedora linux resides on "/dev/sdc1"
Hey Koushik, a bit late though. Make sure that /dev/sda1 under the /boot/efi directory. Add few more parameters to the grub install command, inside the chroot. The directory /usr/lib/grub/x86_64-efi/ should exist, if not then reinstall GRUB. May be because I forgot to add the sudo update-grub at the end of the command list, you too. BTW, what the error screen is actually showing? The grub rescue prompt of the EFI shell? might appreciate seeing an example of the "set root", "linux ..."
You're most welcome, and also thanks for both the suggestion. Surely I'll add some paragraphs related to GRUB target, and if there's separate boot partition. If it's so, then could be fixed exactly like described below. Just find out the correct Linux root partition on the GRUB rescue prompt.